We had Ed, a regular reader of my blog, and his wife over for dinner last night. That’s just what we do. If you can prove you’re a regular reader of this blog, we’ll have you over for dinner. I’ve gone out and washed the cars and shoveled snow from the sidewalks of some steadfast readers who’ve mentioned they’d read something I’d written. It’s about as fancy as my marketing efforts are ever going to get. So if you’re reading this and are not doing anything tonight, feel free to stop by around 6 p.m. for some pasta. Val’s a fine cook. Ed and Mary Ann were great company. They brought brownies, cheap beer and a bed. The bed may seem like a provocative dinner gift, but this one’s destined to become the dream nest of our youngest daughter when she moves out of her crib one day. You don’t have to bring a bed, but we’ll welcome the brownies and beer. When Ed handed me a Knight’s Head Lager -- $9 a case! -- I reached for a handy bottle opener. “Oh, that’s a twist off,” he said. Not to me it isn’t. I don’t twist off bottle tops. It can hurt dainty, ungloved hands like mine. He kind of snickered like I was some sort of sissy. It was exactly the kind of reaction I’m always hoping I’ll get. Then I went on to reel off my manliest bona fides. I lumberjack my own firewood. I’ve gone swimming with stingrays. I’ve been punished by laying down on beds of nails. I’ve gone solo skydiving -- twice! I’ve wrestled alligators. No hype. It’s all documented. So, no, I don’t need to risk tearing any tender pink parts of myself on a beer bottle to prove I’m a man. This is relevant because earlier that day I was listening to Colin Cowherd on Sirius XM satellite radio (that’s some manly stuff going on there too, you know). He was discussing a Sperling’s Best Places report that said Nashville is the manliest city in America. It based this result on the city’s high number of NASCAR enthusiasts, popularity of hunting and fishing, the lack of poofy furniture stores like Ikea and concentration of barbecue restaurants. I lived in Nashville for a few years when I was but a boy so I can’t take credit for its manifest manliness, although I did do my part to help Bar-B-Cutie -- “Scoot yer Bootie to Bar-B-Cutie!” -- on Nolensville Road to prosper. It was in Nashville where I did my skydiving, but I can’t claim to have done much other manly stuff, especially the stuff real manly men enjoy doing. I guess it just wasn’t my time. I remember countless bitter failures to impress dozens and dozens of the Hee Haw Honeys. I’ll never forget their cruel laughter when I’d boldly insist I was a man where it really counted. And, remember, this is back when men who lied about length weren’t talking about their big screen TVs. The Sperlings report got me to thinking about what manly means to me. I guess the top two would involve volunteering for military service, or marrying a woman that already has bratty kids of her own. To me, those initiatives say so much about a man. The latter shows he’s willing to leave an uncomplicated life and enter a challenging relationship with lots of familial baggage and wacky new in-laws just to help give children a father figure that might help shape their lives for the better. It shows a kind of selfless integrity men like me could never muster. 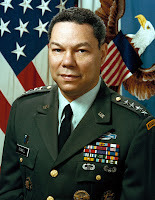 I already admire the man, but if, for instance, Colin Powell starts shacking up with the Octomom or Bristol Palin it would hands down make him the manliest man of all time. I do the best I can. I try to be a good husband and father. I’m involved in raising the kids. I provide a fun, but firm hand for discipline and will continue to do so until the girls realize I tire easily and they can out run me whenever I’m angry. But after Ed challenged me over the twist off, I realized I needed to do something drastic to prove once and for all to him just how much a man I really am. So when the women weren’t looking, I took him into a darkened room and turned on my big 50-incher for him to envy. And I am talking about the TV here.